(Photo credit: Sumio Yamada) By Paul Strauss: What’s a silly movie made in 1966, starring Zero Mostel, Phil Silvers and Buster Keaton got to do with this Saturday night’s HBO PPV fight night at the Thomas & Mack Center, Las Vegas, NV? Maybe it should be rephrased to …….”Life is what happens when you’re making plans”, or in this case game plans. In the classic matchups between boxers and punchers, we expect the puncher to attack, hoping to land the big shot. If that doesn’t work, it’s expected he will continue applying extreme pressure, enforcing a threat, hoping to wear down his opponent and then eventually administering the coup de grace (or a series of them if necessary). On the other hand, the boxer is often expected to stay away, jabbing, moving and building up points in hopes of getting a decision. It’s not that unusual to expect he might even get lucky and cut the slugger and get a TKO. It’s pretty simple, right? The fighter who is best at carrying out his fight plan wins the fight. However, more often than not, funny things happen along the way, and you’ll hear losing fighters in post-fight interviews say things like, “I just couldn’t get off tonight” or “He was faster and stronger than I expected” (Chad Dawson). Maybe the funny thing is “He was in a zone” or “He was really up for this one.” It is an emotional thing that can cause an announcer on nights like that to describe the high level of a fighter’s motivation by saying, “There’s something funny going on here”. (Can you say Buster Douglas) Sometimes new words are even invented as a result of the surprise, such as “rope-a-dope”. This Saturday in Vegas there’s something else amounting to much more than just a little side bar too. Many fans will be bypassing the HBO production, heading to the MGM Grand for Showtimes and Golden Boy Promotions’ big Mexico night card between Saul “Canelo” Alvarez and Josesito Lopez. Fans at home will be making use of the DVR and paying for PPV and recording the free ones. However, there’s a good chance the so called grudge match between Julio Cesar Chavez, Jr. and Segio Gabriel “Marvilla” Martinez will garner the most attention. In fact, it’s already set a new live audience record for the Center. In hopes of counter acting that, It’s admirable that Oscar De La Hoya and Golden Boy Promotions have spiced things up a bit more by offering an additional $100,000 prize which will go to the fighter who is selected by fans as the one who administers the best kayo. What if fans pick an HBO fighter? Remember Marvilla’s specular first round kayo of Paul Williams? Speaking of that side of town, both Chavez, Jr and Martinez are promising knockouts. Freddie Roach, Junior’s hall of fame trainer, doesn’t think Marvilla has the experience to withstand Junior’s pressure, toughness and traps that will be set. Freddie and his charge believe Junior will be able to breakdown Marvilla and then kayo him. Junior certainly seems to be capable of it, and his fans believe it to be true. They feel he’s too big and too strong for the Argentinian, who seems to always be described as a small middleweight. Well, do any of you remember a silly movie titled, “A Funny Thing Happened on the Way to the Forum”? It was a silly, farce and you’re wondering what’s the point in bringing it up in a discussion about a big fight? Well, as the title implies, unexpected things can happen on the way to carrying out your objective, and it should come as no surprise to everyone, there’s a good chance that might be the case Saturday night. Knockout artists and sluggers always plan to dismantle their opponents, saying, “He can’t handle my power”, or “Wait until he feels my power”, etc. Much of the time they are correct, and they do get to their wilting violets and achieve success. But, there are many occasions when funny things happen on the way to derail their attempts. You have Dempsey running into Tunney, Louis almost jumped the track against Conn, or Ali inviting in the fearsome Big George. Often times the kayo artist or slugger pays a heavy price for trying to carry out his objective. Unusually tough guys like Junior’s father weathered the fusillade of leather, and levied their own price. Does Junior really have it in him to do it? Maybe Freddie is correct in thinking that Marvilla isn’t that good? Well, no body is perfect, either in formulating a fight plan, or in carrying it out. Sometimes, a style allows for everything to fall into place, and other times “funny things” happen along the way. It’s those times you hear defeated fighters say those funny things post defeat. Everyone knows that if Junior is to be successful, he somehow has to immobilize Marvilla, trap him on the ropes, pound him to the body, wear him down and get through with the ending blow. In the process, he will also attempt to disguise his attempts, bending in to distract Sergio from his true intentions, which might be a looping shot over the top to his head, all the while trying to keep a tight guard. His plan will also require him to move his head and gloves, when moving in, just enough to avoid Marvilla’s uppercuts. If he is successful, and there are no surprises on the way to his forum, then he will indeed breakdown Maravilla and come away with the victory. However, as Freddie has often been heard to say in Pacquiao’s corner, “He can’t handle your speed, son”! Will that be the “funny thing” that happens on the way to Chavez Jr’s forum? No one disputes that Marvilla is the better athlete of the two. He was proficient at soccer and bicycle racing before mastering the art of boxing, but can he stay out of danger on his way to the forum for victory? Chavez, Sr. voices distain for Marvilla’s style as a fighter. He hates the idea that Sergio fights with his hands down and moves so much. Critics say he is unorthodox and wastes energy. Fans say he is a stylist, an intelligent fighter, and one who studies and breaks down his opponents in a little different way than does Junior. In analyzing this matchup, maybe we can get a bit of a revelation by having fans consider by-passing one against the other, and instead put them against each other’s past opponents. Don’t just ask who has had the tougher opposition. Rather, ask if there are guys the other has fought who might have proved particularly troublesome for the other. Keep in mind too, that it wasn’t too long ago that Junior admitted he wasn’t ready for Marvilla. What happened in the short period of time that has passed to make him change his mind? He beat the likes of Manfredo, Jr., Rubio and Andy Lee. That’s not bad, but does it really signify that much of an improvement? More important, does anyone think that Marvilla couldn’t have handled any of those three? Now reverse things, and try to envision whether Junior could have beaten Kelly Pavlik, Paul Williams, Dzinziruk, Murray, Barker, etc. It’s not quite as easy to be positive this time around is it? In trying to find a chink in Marvilla’s armour, critics go back to his loss against Antonio Margarito, comparing Junior’s style to that of Margarito and predicting similar results. But, is Junior really the current version of the express train Antonio was back in 2000? By the way, speaking of experience, Junior was about 14 yrs old then and hadn’t yet even started his career. Obviously, a lot has transpired for both men since then. Let’s get back to the “funny” part. Frequently when fans and even boxing analysts talk about the classic matchups between boxers and sluggers, they think of a Louis like description, “He can run, but he can’t hide.” Well, a funny thing happened to Paul Williams during his second fight with Martinez. Sergio didn’t run. In fact, he did just the opposite. He moved in close, inside of “The Punisher’s” punches, and planted a perfectly timed left to the rock like chin of an extremely tough fighter, ending things in dramatic fashion. The point is plans can go awry. Carl Froch thought he would be able to get to Andre Ward, but Ward kept him either too close or too far away to be effective. Many thought Manny was foolish in trying to beat a monster like the unusually large welterweight Margarito, fully expecting Antonio to pound him into oblivion. The funny thing was just the opposite happened. In order for Sergio “Marvilla” Martinez to be successful, he will undoubtedly have to carry out some unexpected or “funny” things again, as he did against Williams. In addition to his athletic ability, he will once again have to demonstrate tremendous focus, courage and determination. Undoubtedly he is going to be tagged……..probably more than once. He cannot become discouraged or derailed from what he knows needs to be done. 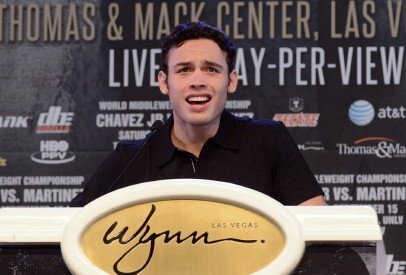 Julio Cesar Chavez, Jr. plans to beat Martinez on the inside. He is confident Martinez will not be able to stay away from him all night long. If that happens, he feels he will be the superior fighter when it comes to administering body shots and uppercuts in close, and that that will be the difference. Casual observers would agree. If Junior gets close, Marvilla’s unorthodoxy could be his undoing. It could boil down to his smaller stature, hands down, and exposed chin. It sounds like he would be outgunned. Of course Sergio doesn’t see it that way. He considers himself to be an intelligent fighter, someone who carefully studies everything his opponent does, whether it’s in the ring or how he acts outside of it. He literally wants to know what makes him tick. The danger of course can be in assuming there’s much “ticking” going on. Some guys just fight, period. They are instinctive. They have no idea why they do this or that. It just happens. They react. It hasn’t been planned for or taught. Is Junior that kind of fighter? There’s also an old saying in boxing about fight plans going out the window as soon as a fighter gets hit, implying that is the norm. But, is it really? The answer is probably not. Tough, dedicated fighters maintain their poise and focus. They keep their cool, press on, or make adjustments if needed. The question remains then, if some “funny” things happen Saturday night, which of these two warriors is going to avoid becoming flustered and get untracked? Book makers seem to be leaning in favor of Marvilla. I ‘ve got to go with the money men. What do you think? Previous boxing news: JC Chavez Jr. set the trap…has Maravilla already taken the bait? Next boxing news: Saul “Canelo” Alvarez: Should the boxing world judge slowly?